Cake, here is a word to make you stop on your heels and go grab a slice. Worry not, this is not a devilish chocolate one. 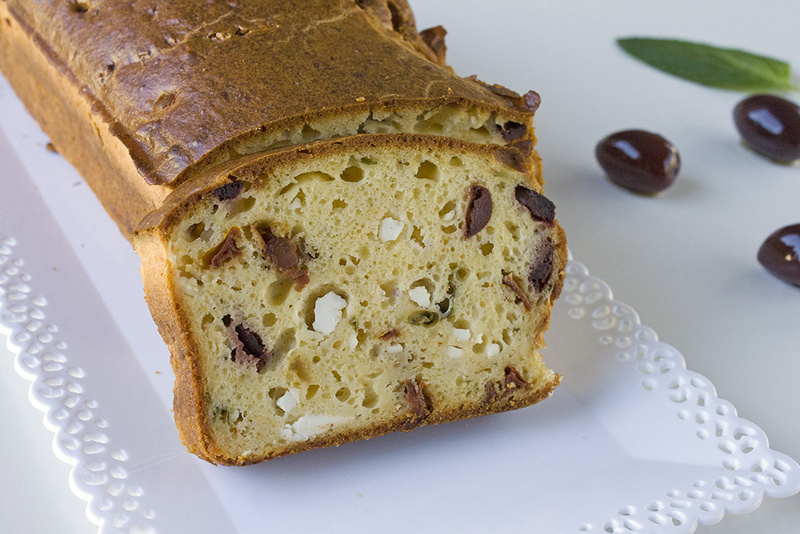 It is filled with delicacies from across the Med: sundried tomatoes, dark Kalamata olives and crumbled feta cheese. The heart-warming smell of baked goodies at home comes next to none. I’ve been working on different variations of this savoury loaf, changing my ingredients as I went. The flavour of this one is as Greek as it gets: Santorini sundried tomatoes preserved in olive oil, dark juicy olives from Kalamata and sharp, barrel aged feta cheese. Unlike the fussiness of bread, you can mix your butter in a jiffy and enjoy a wholesome slice of cake in less than an hour. Ideal for brunch, packed lunches and so very welcome these late hours of the evening you feel like nibbling on something. In a large mixing bowl, sieve the flour. beat the eggs with the melted butter and add them in the flour. Add in the milk and mix thoroughly. Chop the sundried tomatoes, the olives and crumble the feta cheese. Add it to the bowl and fold in gently. Let it cool before slicing it. Yummy! All of my favorite flavors 🙂 I am saving this! I don’t think i have ever had a savory cake.Like the idea though. It’s a really nice treat, especially if you want to avoid super salty snacks or sugary treats. I normally cannot stop nibbling on things, so it’s a good way to try cut down on my cake addiction, loving the texture!